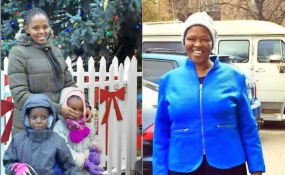 Hamilton, Ontario — A memorial service for a Kenyan-Canadian family of five members that perished in the ill-fated Ethiopian plane that crashed last week was held Saturday in Hamilton, Ontario, Canada. The emotional ceremony attended by the Kenyan High Commissioner to Canada and local state officials was organised by the Kenya community in Ontario. The family of Mr Paul Njuguna who included his wife, mother-in-law and three children; Ryan Njuguna, 7, Kelly Njuguna, 4, and seven-month-old Rubi Njuguna were among the 157 people killed when the plane, enroute to Nairobi, crashed six minutes after take-off on March 10. The family was flying to Kenya from Hamilton, Canada. Also remembered was Mr Derick Lwugi, a Kenyan from Calgary, Alberta. "As you gather here in honour of those who died in the plane crash, I wish on behalf of the government of Kenya, the Kenyan community in Canada to take this opportunity to extend sincere and heartfelt condolences to the families who lost their loved ones, friends and countrymen. My thoughts and sympathies go out to all of you following this terrible tragedy," said the Kenyan High Commissioner to Canada John Lanyasunya. The event was also attended by a representative of the Hamilton mayor, members of the Provincial Parliament, the clergy, teachers from the school where the children studied, and many Kenyans from Hamilton and the Greater Toronto Area. After the memorial, 157 candles were lit to symbolise the number of passengers who perished in the plane crash. Similar events were held in Calgary and Edmonton on March 17, 2019. Friends and neighbours emotionally shared their memories of the Njuguna's. Ms Grace Mugambi, 64, said she felt 'empty' because of the loss of a family she had loved. Photos of the family along with roses and candles were displayed on a table at the council chambers. Two of the children, Ryan and Kelly, were pupils at St. Joseph Catholic Elementary School. Principal Diane Ing said the children exuded "some contagious joie de vivre." (exuberant enjoyment of life). Mr Lanyasunya disclosed that the path of the downed flight was "very popular route" for Kenyans living in Canada and Canadians visiting Kenya. He noted that the two countries had the largest number of casualties. "If we keep our memories of them, what they did in our lives, in our communities, in our countries, we will get the strength to move forward," he said.